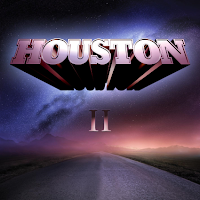 Houston made quite of a splash in the AOR scene with their debut album. It was an unashamedly 80'ies sounding selection of soft rockers with big hooks, awash with keyboards. "II" follows the debut quite nicely and naturally. Producer Ricky Delin has joined vocalist Hank Erix and drummer Freddie Allen as a full-time member on keyboards, with Tommy Denander guesting on guitar and Soufian Ma'Aoui on bass. "Talk To Me" is a slower track, while "Back To The Summer Of Love", "24 Hours" and "On The Radio" are again more uptempo soft rocking with smooth choruses. They might be a bit too sugary for some of you... "Losing" is maybe two degrees heavier, and among my favourite tracks - great chorus and cool keys. "Just Friends" might come with a dentist's warning for extreme sweetness. It's a duet between Hank Erix and Minnah Karlsson, who was the runner-up in Swedish Idol 2010. Minnah's vocals are impressive, but somehow the storyline and the cuteness of it all is just too much... The album closing track "Believe" is a decent enough track, very Totoesque ("Isolation"-era), although I must say that the accapella intro could've been edited out - the "choir" sounds like they're all almost asleep! Houston have managed to create a rather appealing sound for themselves. Although their Rock is that of the softest kind, there's still energy and passion in their songs. You might call them cheesy or sugary, but at least they're not bland! First class wimp rock. OPPOSING MOTION: "Laws Of Motion"
FIND ME: "Wings Of Love"
SHANNON: "Circus Of Lost Souls"